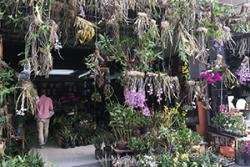 Working in two very different locations in China, Xishuangbanna, a sparsely populated rural area in southwest China, and Hong Kong, a densely populated metropolis, researchers found that consumer preference was not driving demand for wild or rare orchids in Chinese flower markets. The information can be used to devise strategies to conserve wild orchids in the highly-threatened Indo-Burma Biodiversity Hotspot. As Dr. Freya St John of Bangor University explains: "In this case, what we found was that consumers just want cheap colourful flowers, and would be just as happy buying cultivated plants. The markets have wild plants for sale not because that's what the consumer wants, but because some traders find this the easiest way to supply the market with cheap colourful plants. The best way to conserve wild orchids might be to strengthen enforcement of existing regulations to prevent wild plants being sold, and support legal businesses selling sustainable commercially grown orchids." "The wildlife trade is complex and is not a single entity or market—in some cases consumer demand for unsustainably-sourced wild products is the problem, but in other cases the supply is driving the trade. Studies like this are important because without knowing what drives an illegal market, there is no way we can know how to address it." Dr. Sophie Williams, who initiated this research while working at Bangor University said: "I'm really pleased that this work is now published and that I continue to contribute to conservation science."